If you want your next meeting or conference to be memorable for your customers, clients, or colleagues consider this executive meeting room! This NYC meeting room rental in the district of Koreatown is your perfect match! What’s unique about this room is its sophisticated and timeless design and the sturdy finish that is pleasant to the eye and impresses with its quality. 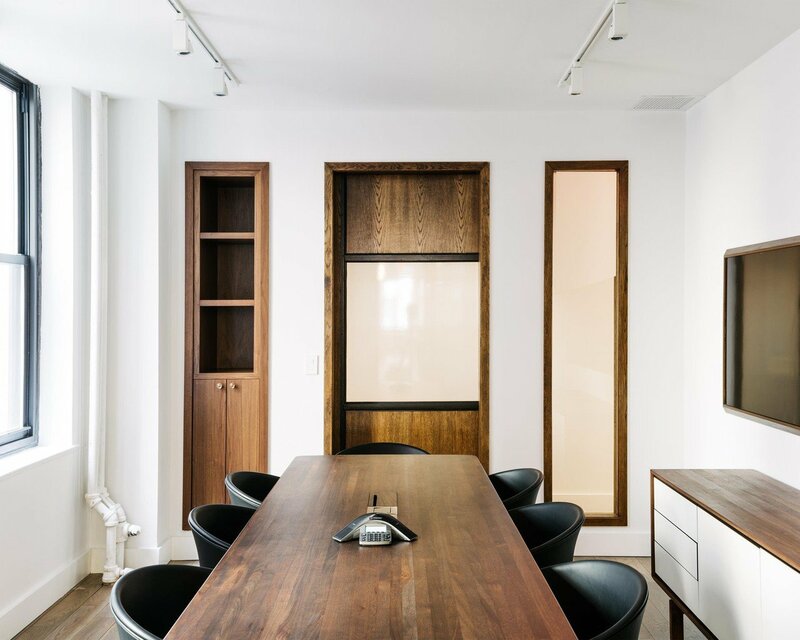 The long, wooden table will offer up to twelve people a comfortable space to work, discuss and brainstorm together, which means it is the perfect space for smaller and larger companies who are in need of a conference room for hire outside their own office. We will provide everything else that is needed to ensure your meeting will be fruitful and efficient. Presentations can be visualized on the large TV that is included in the hire price. Of course, we are happy to provide complimentary Wi-Fi, water and a conference phone. Additional drinks and food including various lunch options can easily be added on your behalf. If you would like to present your business plan to your hosted group, be sure to incorporate the large blackboard included in the room! To make your work feel effortless, the abundance of natural light and white walls give this space a light and friendly atmosphere. And on the topic of atmosphere: this meeting room in Koreatown is situated in a larger coworking space, where you will be exposed to the motivating environment of young entrepreneurs and forward-thinkers that are working on their current break-through projects. Be assured that you’ll feel right at home and able to work undisturbed, no matter what the purpose of your meeting is. As described above, this NYC meeting room is located in Koreatown, one of Midtown’s primium locations. That means it is very easily reachable with various subway lines, the closest of which (line 4 and 6) stop only meters away from the venue. It also means that your NYC meeting room for hire is situated in one of the most vibrant and exciting parts of Manhattan, offering great views and countless points of interest in close vicinity (such as the wonderful Madison Square Park, the Empire State Building and various good restaurants and bars. We are looking forward to hosting you at this conference room in Manhattan and to ensuring that you have a memorable stay.